Melt butter in a medium sized saucepan. Add brown sugar and stir to combine and slightly melt. Add half of the cream, stir to combine and remove from heat. In a separate bowl, beat egg yolks lightly. Stir in a little of the warm cream mixture into the eggs. Add egg mixture into the warm cream in the saucepan stirring constantly. Put saucepan back on medium heat and cook, stirring constantly until custard is thick enough to coat the back of the spoon. Add remaining cream, vanilla, and salt and place the custard in the refrigerator or freezer to cool down. Cover a baking sheet with aluminum foil and add bacon. Lightly pat remaining ¼ cup of brown sugar onto each bacon strip. Bake for 8 minutes and turn each piece over. Bake an additional 6 minutes, checking to make sure it doesn’t burn. Remove from oven and place bacon on a metal cooling rack if you have one or another piece of foil if you don’t! When bacon is cool enough, crumble into little pieces. When custard mix is cool enough, add it to an ice cream freezer and process according to manufacturer’s directions. 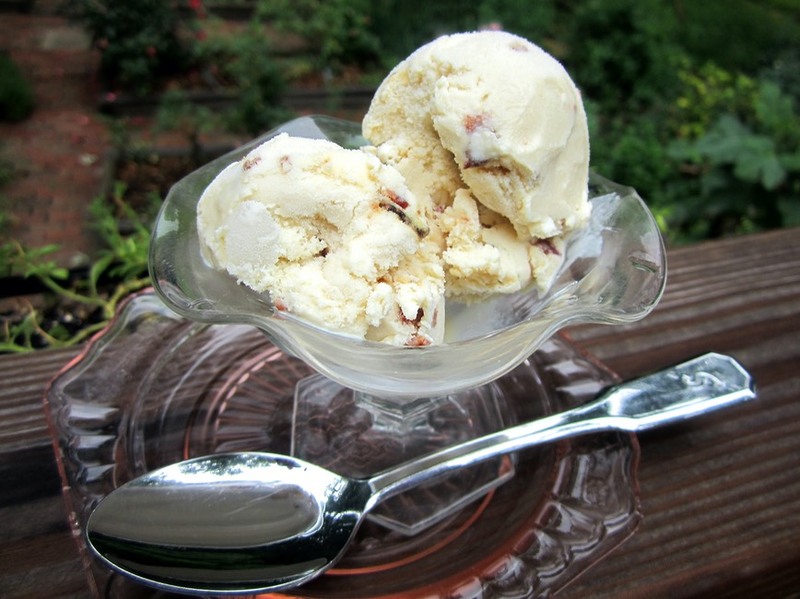 When the ice cream is processed add bacon and mix for a minute more. Add Jack Daniels and mix for another minute. Put ice cream in a container and see how long it takes to disappear!